Kara battles the villains from last issue on the rooftops. At Harvard, Alex's friends want to know how he knew all the private details of their lives, but he says he's heading back to Metropolis and then his eyes glow red (and so do the eyes of his friends), which is apparently making them no longer remember him. Alex watches Kara's battle on his FlyOver app, and then goes to a room with a massive computer called "Father" to watch the battle in more detail. As Supergirl talks to the two guys filming her for their FlyOver app, Alex orders retrieval of the villains and they disappear from the rooftop and appear in his lab. Just then Lois arrives via helicopter to ask Kara for help with her Cadmus story. Cadmus has apparently made a rogue metahuman with Kryptonian DNA and Lois wants Kara's help figuring out what's going on. Kara worries she's not up to Superman's level, but Lois has faith in her and then gives her a smartphone (which Kara seems to be completely clueless about) so that she can track the villains. In his lab, Alex has located Robin and Blue Beetle. He's also now covered in blood, and there's bodies in chambers behind him that he calls his foot soldiers. He opens a portal. In an ice cream shop, Kara uses the FlyOver app and sees Robin battling Mr. Freeze and Clayface, and zooms off to help him. 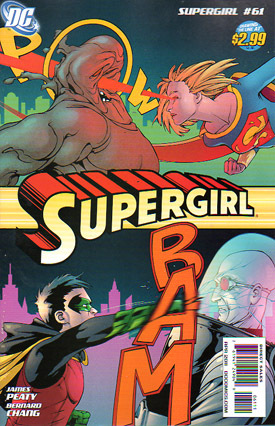 They battle the villains who go down rather easily, and Kara is then about to fly off to help Blue Beetle when the villains erupt in some kind of electricity and are revealed to be some kind of clone robots... or something. The entire angle with Alex's friends was completely pointless, especially as I now expect they'll be forgotten and never mentioned again. If they play a part later on in the story then all is well and good, but if not we wasted how many pages on them over two issues that served no purpose other than for Alex to monologue to. And in this issue he's already able to monologue and exposition-dump with "Father," so why not just have it that way from the start? The villains not really being the villains they appear to be was far too telegraphed (you'll note I called the obviousness of that in my review of the previous issue), but there's even some inconsistency there. Kara fights some of the clone robots and it seems to be a tough battle (to the point she's even BLEEDING), but then when she arrives to help Robin they go down like chumps and she talks about how they're barely even putting up a fight. If they're all the same clone robots, which is it? Can they give Supergirl a run for her money or are they mostly useless and made of tissue paper? It's the little details like that which drag down an otherwise highly enjoyable story. As another perfect example, last issue was titled "Part One: Good Looking Corpse" but this issue is titled "Good Looking Corpse, Part 2". So was part one of the story called "Good Looking Corpse," or is the entire story called "Good Looking Corpse" and we're getting it in parts? Or is part one of the story "Good Looking Corpse", which has two parts, and next month we get "Part Two: Another New Title"? This is irrelevant in the grand scheme of things (and didn't affect the story rating), but I point it out simply as an indicator of the detail problem this book is suffering from right now. If you can't even keep your title consistent then perhaps you need a little more attention to detail. The important thing now is that at least the broad strokes are good and the book is entertaining. Just a little extra care applied to the little things as well as the big things would go a really long way. Art - 3: It's hit and miss for me again. Lois, again, looks pretty good, but in most panels Kara actually looks like Paris Hilton to me... which is not someone I want to be seeing in a Supergirl comic. Kara and Lois are, again, rail-thin in just about every panel, and they just look malnourished to me. Everyone else, however, looks pretty good. Cover Art - 5: This is totally different from your typical cover and I completely love it. It's exciting, it's story-accurate, and it's creative. Having the heat vision and punch go through the sound-effect words is particularly clever. Very well done.